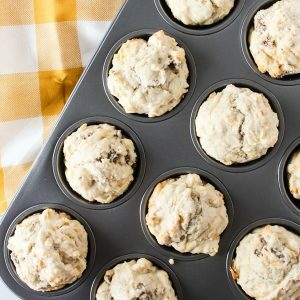 Make these Savory sausage and cheese breakfast muffins for a quick breakfast option on busy mornings, or when you just don't feel like making breakfast. Preheat oven to 400 degrees and grease a muffin tin. Set aside. In a large bowl, whisk together flour, crumbled sausage, cheese, baking powder and salt. Set aside. In a small bowl mix together milk, egg and butter. Add wet ingredients to dry ingredients and stir until just combined. Do not over mix or muffins will become hard. Fill muffin tins 2/3 full with mixture. Bake for 15 minutes or until muffins are golden brown. Remove from tins and serve warm. Keep leftovers in fridge for up to 1 week. You can freeze extras by wrapping in saran wrap and placing in ziploc bag. To use, wrap muffin in paper towel and microwave for 20-30 second intervals until warmed.